In an inguinal hernia, abdominal fat or a loop of small intestine enters the inguinal canal, a tubular passage through the lower layers of the abdominal wall. It occurs when part of an internal organ (usually the small intestine) protrudes through a weak point or tear in the peritoneum, the thin muscular wall holding the abdominal organs in place resulting in a bulge. In men, inguinal hernias typically develop in the groin area near the scrotum, on one or both (double hernia) sides. An inguinal hernia may arise at any time from infancy to adulthood. However, it is far more common in males with a lifetime risk of 27% in men and 3% in women. Some individuals are born with weak abdominal muscles and are more likely to develop a hernia. Others are caused by excessive strain on the abdominal wall from heavy lifting, weight gain, coughing, or difficulty with bowel movements and urination. An incarcerated inguinal hernia is a hernia that becomes stuck in the groin or scrotum and cannot be massaged back into the abdomen. An incarcerated hernia can lead to a strangulated hernia, in which the blood supply to the incarcerated small intestine is jeopardized. A strangulated hernia is a serious condition and requires immediate medical attention. If left untreated, nausea, vomiting, and severe infection can occur. If surgery is not performed right away, the condition can become life threatening, and the affected intestine may die. Then that portion of the intestine must be removed. To diagnose inguinal hernia, the doctor takes a thorough medical history and conducts a physical examination. The person may be asked to stand and cough so the doctor can feel the hernia as it moves into the groin or scrotum. The doctor checks to see if the hernia can be gently massaged back into its proper position in the abdomen. If the diagnosis is not clear, further imaging tests may be required, like an ultrasound (uses benign sound waves to view inside abdomen) or CT (multiple detailed x-rays) scan. 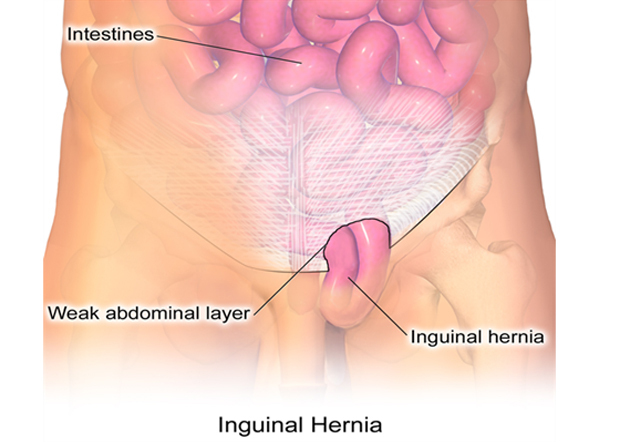 Inguinal hernias that enlarge, cause symptoms, or become incarcerated are treated surgically. Surgery is usually done on an outpatient basis. Recovery time varies depending on the size of the hernia, the technique used, and the age and health of the patient. In open hernia repair, a person is given local anesthesia in the abdomen or spine to numb the area, general anesthesia to sedate or help the person sleep, or a combination of the two. Then the surgeon makes an incision in the groin, moves the hernia back into the abdomen, and reinforces the muscle wall with stitches. Usually the area of muscle weakness is reinforced with a synthetic mesh or screen to provide additional support-an operation called hernioplasty. Laparoscopic surgery is performed using general anesthesia. The surgeon makes several small incisions in the lower abdomen and inserts a laparoscope-a thin tube with a tiny video camera attached to one end. The camera sends a magnified image from inside the body to a monitor, giving the surgeon a close-up view of the hernia and surrounding tissue. While viewing the monitor, the surgeon uses instruments to carefully repair the hernia using synthetic mesh. People who undergo laparoscopic surgery generally experience a somewhat shorter recovery time. However, the doctor may determine laparoscopic surgery is not the best option if the hernia is very large or the person has had pelvic surgery. Most adults experience discomfort after surgery and require pain medication. Vigorous activity and heavy lifting are restricted for several weeks. The doctor will discuss when a person may safely return to work. Surgery to repair an inguinal hernia is generally safe and complications are uncommon. Knowing possible risks allows patients to report postoperative symptoms to their doctor as soon as they occur. Before surgery, the anesthetist-a doctor who administers anesthesia-reviews the risks of anesthesia with the patient and asks about medical history and allergies to medications. Complications most likely occur in older people and those with other medical conditions. Common complications include nausea, vomiting, urinary retention, sore throat, and headache. More serious problems include heart attack, stroke, pneumonia, and blood clots in the legs. Getting out of bed after surgery and moving as soon as the doctor allows will help reduce the risk of complications such as pneumonia and blood clots. A hernia can recur up to several years after repair. Recurrence is the most common complication of inguinal hernia repair, causing patients to undergo a second operation. Bleeding inside the incision is another complication of inguinal hernia repair. It can cause severe swelling and bluish discoloration of the skin around the incision. Surgery may be necessary to open the incision and stop the bleeding. Bleeding is unusual and occurs in less than 2 percent of patients. The risk of wound infection is small, less than 2 percent, and is more likely to occur in older adults and people who undergo more complex hernia repair. The person may experience a fever, discharge from the incision, and redness, swelling, or tenderness around the incision. Postoperative infection requires antibiotics and, occasionally, another procedure requiring local anesthesia to make a small opening in the incision and drain the infection. Sometimes people experience sharp, tingling pain in a specific area near the incision after it has healed. The pain usually resolves with time. Medicine may be injected in the area if the pain continues. Although extremely rare, injury to the intestine, bladder, kidneys, nerves and blood vessels leading to the legs, internal female organs, and vas deferens-the tube that carries sperm-can occur during hernia surgery and may lead to more operations.